Appearance: Conrad has regular meerkat markings, with dark brown for his markings and top of his head, light brown for his body, and cream color for his tummy and chest, and under his arms. He has a fair build, but is somewhat thin. He has medium-long blonde hair, which he keeps neatly ponytailed to the back. His bangs are long, and split in two in front of his face. Clothes: Conrad tends to change his choice of clothes quite a bit. 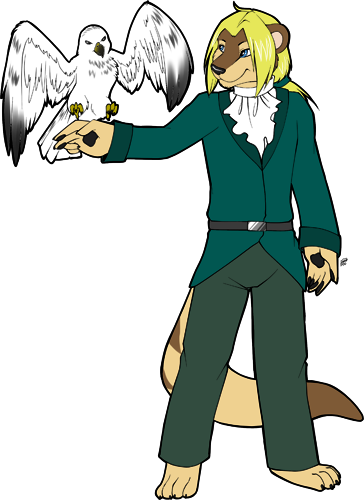 He sometimes likes to sport a prestigious gentleman look, with a dark coat and dark pants, but he usually likes to wear regular pirate shirt and pants. It doesn’t necessarily make a difference to him, because they all get dirty in use. Conrad Bastilian is a calm, easygoing 27 year old Meerkat. He was born and raised on Meerkat Cove like all the other meerkats. He doesn’t like to be idle, and he’s always found working or tending to small tasks around the ship. He doesn’t talk much, but tries to keep in contact with the captain. Conrad joined the Clan merely for his love of adventure. He’d never seen Shoalrije, as many meerkats hadn’t. Hearing that Kiapa would be holding an expedition, he immediately joined. It didn’t take long for him to fall in love with her, and he was determined to win her heart, and position as quartermaster. After being exiled from Meerkat Cove, his love for her grew, up until the death of Kiapa’s daughter. She became sour, and appointed her brother the quartermaster position, instead of Conrad. Ever since, Conrad lost interest in Kiapa, and began to hate Rizax. The only thing holding him back on the Meerkat Vessel was his position as Ambassador of the Meerkat Clan, accompanied alongside by his trusty messenger eagle named Sean. After a night of finally confessing his feelings for Kiapa, he decided to turn his life around and join Feralys, in spite of the woman who broke his heart once before. Unaccepted at first, it would be tough to pursuade his new crew that he’s not like his former crew.